The Supreme Court of Texas. In Centex Homes and Centex Real Estate Corp. v. Buecher the issue is whether homeowners can waive, by contract in buying a new home, the implied warranties of habitability and "good and workmanlike" construction for the house where the language in the contract is "clear and free from doubt." The homeowners sought in a class action to prevent Centex from enforcing the waiver included in their sales documents. The trial court dismissed the class action, but the court of appeals reversed, reasoning that policy considerations giving rise to implied warranties prevented their disclaimer in this case by a preprinted standard from waiver. The Chief Justice Phil Hardberger of the 4th Court of Appeals said it best, "The burden on the home builder is not great: only that the home be built in a workmanlike manner and be fit for human habitation." The relief sought by Centex Homes from the Texas Supreme Court is a bold and shocking display of their intent to produce a substandard home, and not be held accountable. The very idea that any builder would subject himself to the public ridicule of such a request is astonishing. Centex attorneys had the humiliating task of explaining to the highest court why their client thinks it is too high a standard to build a home that is fit for human habitation. Our Texas Legislature had a specific intent when they passed the state law of an "Implied Warranty." The intent of our Legislature was to provide protection to the home buyer from predatory business practices by unethical home builders and to hold them to a minimum standard of "Good Workmanship of Habitability." Centex is asking the Texas Supreme Court to clearly change the intent of that law, rather than having it amended by the State Legislature. The home-building industry generally advocates and promotes contractual requirements that openly display their indifference to delivering a quality product. Evidence of this is that most home builders include this shameful statement in their contracts to build a home: "...Builder makes no warranty, express or implied as to quality, fitness for a particular purpose, merchantability, HABITABILITY or otherwise..." Centex has gone a step farther with its no shame policy. Their take- it-or-leave-it unilateral contract agreement requires that unless the buyer agrees to give up his or her right of implied warranties of good and workmanlike construction and habitability, they will not sell them the house. Now Centex is shamefully asking the Texas Supreme Court to give their endorsement of the practice of substandard home building with little or no warranty. CENTEX ATTORNEYíS ARGUE: IMPLIED WARRANTY STANDARD IS TOO HIGH. 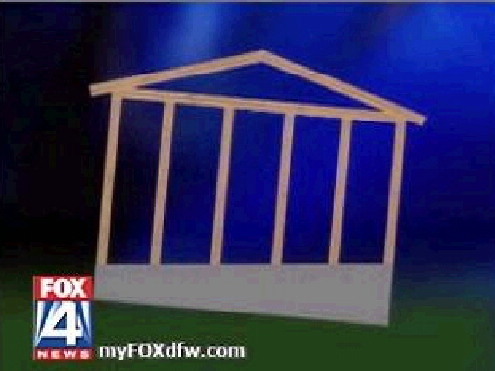 Centex attorneys argue that the home buyer does not need an Implied Warranty if they are provided a "Limited Warranty." The key word is "LIMITED." If the Supreme Court rules in favor of Centex it will be the end of any semblance of a home warranty as we know it today that is already a mockery. The limitations imposed and exclusions are innumerable. Such basic household items as kitchen sinks are excluded. As a result, the builder installs the cheapest substandard (sometimes rejected) product, knowing it will not last the first year. To avoid responsibility under the warranty, builders provide what appears to be helpful homeowner maintenance booklets or brochures after closing, with such titles as, "Landscaping and Foundation Care." What appears to be a helpful guide for home maintenance is in reality a disclaimer of responsibility for builder liability of defects and even foundation failures. JUST WHEN WE THINK WE'VE HEARD IT ALL. "PICKETING AND DEMONSTRATION - picketing, protest marches, sit-in demonstrations, protest speeches, or other forms of public protest...Owner, by acceptance of the deed to any Lot, shall be deemed to have accepted the foregoing prohibitions as REASONABLE LIMITATIONS on his or her CONSTITUTIONAL RIGHT TO FREE SPEECH..."
Buying a Centex Home means no Implied Warranty for Good Workmanship and Habitability, no Constitutional Right to a trial by jury, and Restriction of Constitutional Right to Free Speech. If the Texas Supreme Court affirms Centex's request, it will send a message across the country. Then all other builders will follow their lead. What will become of "THE AMERICAN DREAM?" On Wednesday, November 29, the Texas Supreme Court will hear arguments in a case that could seriously lower the quality standards for new homebuilders in the state of Texas. In Centex Homes v. Buecher, the Texas Supreme Court will consider whether home builders in Texas will be required to guarantee, through long standing implied warranties, that the new homes they build and sell to Texas families are suitable for human habitation. Consumer protection organizations and homeowners rights groups are monitoring this case because of the seriousness of its impact on Texas families and Texas homeowners rights. This case also serves as an early test for how moneyed special interests will fare at the Supreme Court this session. "For years homebuilders in Texas have been held to a simple standard - provide new homes to Texans that are well-built and suitable for human habitation." said Dan Lambe, Executive Director of Texas Watch. "Now Centex Homes is suggesting that such a bar is too high a standard and they are running to the Texas Supreme Court for relief." "Buying a home is often the largest and most important purchase a family ever chooses to make." said Kathi Fragnoli, co-founder of HOME, a homeowners rights group based out of Arlington, Texas. "Now one of the largest home builders in the nation and our state, Centex Homes, is seeking an exemption from one of the most basic and reasonable warranty standards imaginable." habitation." continued Fragnoli. "If Centex Homes is allowed to waive these most basic standards of quality in their warrantees, the losers will be unsuspecting and often unknowing Texas home buyers." said Janet Ahmad, President of Homeowners for Better Builders, a national homeowners assistance and advocacy organization. "If Centex wins this case then the buyer of a toaster oven, a VCR or a microwave will have more legal rights to seek repairs than the buyer of a brand spanking new home." "This case pits wealthy special interests against the interests of Texas families." said Cris Feldman of Texans for Public Justice. "Centex Homes lawyers have invested a tremendous amount of money in this Texas Supreme Court. Baker and Botts and Bracewell & Patterson have given the justices over $350,000 in recent years. Bracewell contributed $5,000 each to Justice Gonzales and Hecht in the pas two months alone, while Baker & Botts subsidizes Supreme Court clerk salaries." New homebuilder warranty claims are low, while homebuyer complaints are at an all-time high? Corporate builders are using subcontractors, often employing a labor force without the training required to build quality homes. This practice of using a shadow workforce leads to poor workmanship and record number of homeowner complaints...In the spring of 2006 CFQH surveyed Centex Homes consumers in several markets. How would you rate your experience with Centex Homes? How would you rate the quality of your new home built by Centex Homes? ...no owner or resident of any lot shall engage in picketing, protest marches, sit-in demonstrations, protest speeches, or other forms of public protest ...Each owner, by acceptance of the deed to any lot, shall be deemed to have accepted the foregoing prohibitions as reasonable limitations on his or her constitutional right of free speech." The following is a scan of Article VII of the Declaration of Covenants signed by Centex Division President and filed with the State of Texas. By accepting the deed to any lot homeowners have given up their rights to free speech and cannot picket or protest. KENS TV Outlook Canyon Creek residents upset at home builder (07/31/02) (video unavailable) photos coming soon. KMOL TV Centex Homes They were supposed to be dream homes, but some people on the northwest side say they're houses are a nightmare. News 4's Joel Eisenbaum has the story. July 21 Profit Increases 56 Percent at Dallas-Based Construction Firm Centex Corp. Source: The Dallas Morning News Jul. 19 2001Dallas-based Centex Corp. reported a 56 percent jump in profit on Wednesday as a result of big increases in home sales and financial services income. June 27, 2001 Law Firm Estrada & Thomson Announces Class Action Lawsuit Against Centex Homes. The proposed class includes 207 homes located in the Serrano, Crescent Ridge and Treelake Village subdivisions located in El Dorado Hills and Granite Bay. For detaisl see the Estrada & Thomson website. May 10, 2001 Posted to the Centex Page: No. 04-99-00337-CV Michael M. BUECHER, et al., Appellants v. CENTEX HOMES, a Nevada Partnership, and Centex Real Estate Corporation d/b/a Centex Homes, Appellees. "It would be incongruous if public policy required the creation of an implied warranty, yet allowed the warranty to be disclaimed and its protection eliminated merely by a pre-printed standard form disclaimer or an unintelligible merger clause." Apr 2, 2001 Posted new pictures of the new siding on the home. After many years of fighting Centex, they finally did the right thing. Feb 18, 2001 Posted a PDF Copy of the Amicus-Curiaesupplied to the Texas Supreme Court for Centex Homes v. Buecher in support of Centex. A review of this amicus is also available. Feb 15, 2001 Posted a Review of the Amicus-Curiae supplied to the TexasSupreme Court for Centex Homes v. Buecher in support of Centex. 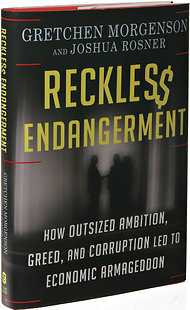 Quote: "Between 1987 and 1998, Home Buyers Warranty Corporation, one of the laargest providers of ten-year insured warranty programs in Texas paid an average more than $0,000 per accepted structural claim to home owners in Texas"
Loss or damage resulting from, or made worse by the the presense of hazardous or toxic materials resulting in uninhabitability or health risk within the home. 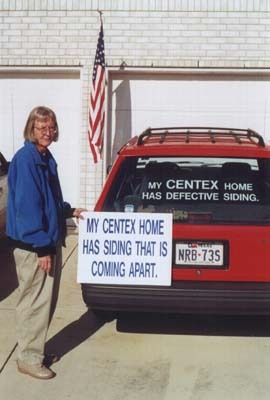 Jan 23, 2000: Posted in Centex Page: New photos of the ABTCO siding installed on a Centex home. These photos were taken during a site visit by HOBB. Dec 12, 2000: Posted in Centex in the News: (Posted at 4:10 p.m. EST Saturday, December 5, 1998 )Home built over source of lethal gas By AMES ALEXANDER Staff Writer . Deborah West, a former Centex employee who now sells new houses for Century 21, is suing Centex Homes and The Crosland Group over the problems. 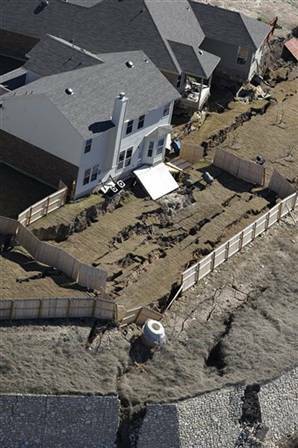 In her suit, West says the buried material has also caused the house to settle, causing cracks throughout. products from ancient forests worldwide. Dec 12, 2000: Posted in Centex in the News: One of America's largest housing developers will pay a black couple $71,000 to settle a complaint accusing the firm of refusing to sell the couple a San Francisco Bay area home, Housing and Urban Development Secretary Andrew Cuomo announced today. Cuomo said that Centex Homes, a division of Centex Real Estate Corporation, agreed in an enforcement agreement with HUD to settle a housing discrimination complaint filed with HUD in 1997 by Oakland, CA residents Sylvia Myles and Bruce Soublet. Centex admits no wrongdoing in the settlement. 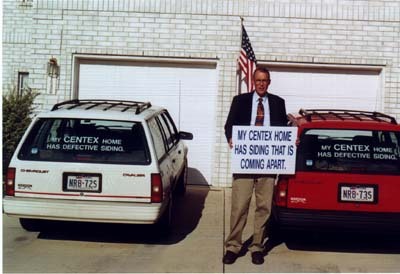 Dec 10, 2000: Posted in Centex in the News: Home buyers await court ruling on general vs. express warranties By DAVID KOENIG Associated Press. "Centex says it is doing buyers a favor by requiring them to sign the express warranty. It argues that the state's so-called implied warranty, with terms such as "habitability" and "workmanship," is so vague that it leads to disputes between buyers and builders. " Dec 10, 2000: Posted More pictures of the siding on the home with mold and 1/2 inch gaps. Dec 8, 2000: Posted in Centex in the News: Owners, Builder Clash Over Waived Implied Warranty "If Centex wins this case, then the buyer of a toaster oven, a VCR or a microwave will have more legal rights to seek repairs than the uyer of a brand spanking new home," says Janet Ahmad of San Antonio, president of Homeowners for Better Builders. Nov 26, 2000: Posted Supreme Court and Centex Homes Press release. Nov 22, 2000: Posted Article IV of the Spring Creek Forest Subdivision Declarations of Covenants. This legal document, filed with the State of Texas, specifically restricts homeowners rights to freedom of speech by disallowing picketing, protesting, and displaying of signs in the yard or on a car within the subdivision. This document filed with the State of Texas, is signed by Damon Lyles, Division President, Centex Real Estate Corp, As the saying goes....No Place but Texas! 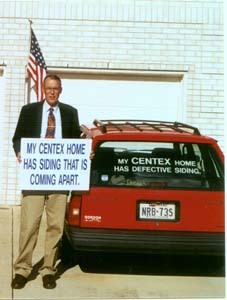 Nov 19, 2000: Posted pictures of homeowners advertising the quality of their home built by Centex. Picture 1, Picture 2, Picture 3. Nov 3, 2000: Scheduled to be heard in the Texas Supreme Court Nov 29, 2000. 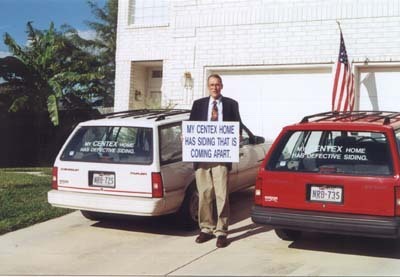 00-0479 CENTEX HOMES v. BUECHER Background story Nov 23, 1999: "Court gives win to home buyers". The San Antonio Express News. "Purchaser agrees to accept said homeowner's warranty at closing in lieu of all other warranties, whatsoever, whether expressed or implied by law, and including but not limited to the implied warranties of good workmanlike construction and habitability. Purchaser acknowledges and agrees that seller is relying on this waiver and would not sell the property to purchaser without this waiver." Translation: Although the state of Texas has long held that new homes have an implied warranty of workmanlike construction and habitability, your warranty is only what is covered in a 24-page insurance...... "
Nov 2, 2000 City warms to study of stacked appliances By David Anthony Richelieu and Bill Pack Express-News Staff Writers "It's taken us three years to get someone's attention, so I would have to see City Council's decision as a positive step forward." -- Janet Ahmad, HomeOwners for Better Building. Oct 26, 2000 Added to Builders in the NewsAC placement fuels hot fight [San Antonio, TX] By David Anthony Richelieu Express-News Staff Writer. The City Council is expected to resolve a dispute today over whether the stacking of air conditioning units over electric hot water heaters should be allowed to continue in new homes and apartments. "....the city has a moral obligation to change a potentially dangerous practice, adding that it was only a matter of time before a water heater short circuit would trigger a larger fire and put people's lives at risk." Press Release HomeOwners for Better Building. Oct 18, 2000Added to Builders in the NewsGroup questions electrical code By David Anthony Richelieu Express-News Staff Writer.